I’ve been wanting to do this for some time, but well…I’m somewhat lazy. Anyways, here’s how a comic strip at MyLifeComics is made. I keep a list of things that have happened over the past days so I don’t forget. When it’s time to draw, I scan the list and pick the one that I want to do. 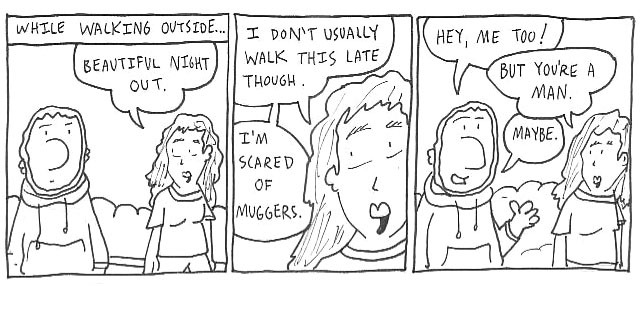 For this comic, the note simply said out walking, scared of muggers. Next, let’s call this officially Step 1, I do a loose sketch to get an idea of what I want the comic to look like. At this stage, I’m seeing if the dialogue and art mix, and what kind of little details I want that I can remember. My sketching is pretty crude, but I generally only have to draw it out once. Step 2 is drawing the comic strip on paper. I switch between a 2H and 5B pencil. I actually ink simultaneously at this stage as I go. Call it compulsive, but I can’t just leave pencil art on paper without inking. I think I have a fear of a ghost erasing it when I’m not looking. After this is Step 3, where I scan the artwork into my computer and open it in Adobe Photoshop Elements 3.0 to start coloring. There’s a few other little things I do at this point to clean up the artwork, but it’s really boring so I won’t go into it. I do have a copy of Photoshop 6.0, but it doesn’t work too well on my dinosaur-slow computer, and after constant usage I grew used to using Elements. So, at this stage I put down the base colors of the comic on a separate layer. I dislike bright tones. Step 4 has me coloring on a second layer, adding shadows and some simple shading. Lastly, Step 5, the easiest one. I toss the date the comic will be posted on the bottom right corner of the artwork. Comics are drawn a few days in advance, with the topic of the comic probably being a week or so old. Yeah, it’s a weird schedule but it works for me. And that’s how I do things over here. Capiche? way to go, artist extradinaire! i think i forgot an “o” in that word? Why thank you, bri! Hope you continue to like ’em. I just find your page and I’ve been checking your strips and god! I really find them easing and fun. It’s very kind of you that you bother to explain how you make your strips. Hope to visit this site often to check what’s new. Cool ey does anyone else notice snow alling to the screen or is it just me? ohh well pretty cool! Yup, it is snowing all over WordPress for some time. Very neat indeed. Wow, I love your work, the best piece of of course the proposal. Thanks for sharing your comics!